Lying on the back place the hands down on the mat beside the hips. Bend the knees and take the heels quite close to the buttocks. Raise the pelvis and chest remaining grounded with the shoulders, neck, head and feet. Take the heels off the mat and move the feet back until they are under the tailbone. Rest on the heels. Place the hands down beside the head and rise up on top of the head. The hands can remain there for support of be placed on the chest in prayer position. Experiment, there are many other positions for the hands and arms. Open the knees a little and try to take them all the way down until they are grounded. Create space around the neck for the elements to flow. Increases the strength and flexibility of the shoulders and neck. Increases the flexibility of the lower back and quadriceps. When the knees are taken down the quadriceps are really stretched but other muscles and tendons are stretched that are not so apparent. In this case the flexor hallucis brevis a muscle that runs under the feet and attaches to the big toe gets a great stretch. Give alternatives if you are in a flow. Good alternatives are Bridge or Bridge on your head. 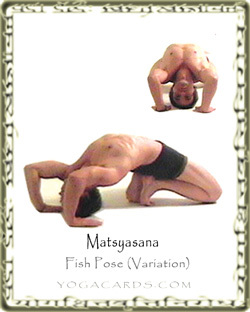 The pose shown can even be done with the shoulders on the mat. For a much less strenuous position allow the knees to raise a little.